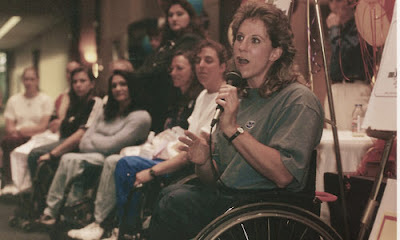 Walking, Way Overrated: Be Inspired..."Determined to Win"
Keeping in step with what we said we would do - meet another inspirational person who happens to use wheels for legs, just like us! 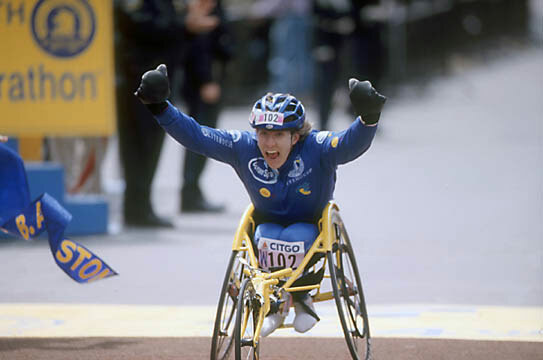 Born with Spina Bifida, a cousin to Spina Bifida Occulta, which is what my husband Craig has, Jean Driscoll is world record breaking athlete who loves Jesus Christ and shares that love in some incredibly unique ways. Ways that could only happen because of her hard work and physical abilities. Coaching the first ever, paralympic racing team in Ghana, Africa is one of those ways! Spina Bifida is a disability that affects the spinal cord in varying degrees. It is why women who are wanting to get pregnant, are to take Folic Acid because it helps to prevent any anomalies from forming in the the development of this area. Personally, most of the individuals I have met throughout my life, who live with spina bifida, generally have semi or full paralysis from the waist down and can use braces and walkers or they use a wheelchair to get around. As with most who have spinal cord issues, whatever you use gets extra strong, meaning these individuals have super upper body strength. Just like when a person who can't hear, has heightened other senses to compensate, truly an amazing feature that God designed. Like I mentioned in a previous article, children who are like myself, born with a disability, are generally quite happy and content because it is who we are, all we know. From the age of eleven until I was seventeen, I lived in an eighteen bed institution built to provide a place for children living with physical disabilities. Most kids lived there because like mine, our home towns, weren't equipped with wheelchair accessible schools or places you could receive physical, speech or occupational therapy. Sadly, that was when I first learned that there were others who had been abandoned by their biological parents into foster care, unable to accept their child's needs. Seeing those dear peers, caused me to be extra thankful for the family I was able to visit with every other weekend and holidays. Thankfully these days, in Canada, much has changed. There are funds available to assist parents with things like home support, respite and easier access to all of those therapies that are so often needed, not to mention, wheelchair access to government funded buildings is law. One precious lady often comes to mind when I remember my days there, Pamela had white blonde hair, blue eyes and spoke ninety miles an hour. She didn't let spina bifida stop her from anything, determined to get where she wanted, she'd often ditch her wrist crutches, lie tummy down on the floor and using her elbows to propel her tiny, thin body up and down the long halls, leaving them with a fine polish! Jean was also quite mobile when she was young, with the assistance of devices. It was after she had undergone many surgeries in her early teen years, that she discovered walking wouldn't be better but impossible. Facing a new way of getting around, she faced some very serious struggles. The video documentary focuses on how Jesus touches her life in ways she hadn't imagined. I don't want to spoil the story by saying too much, you will have to find out for yourself, just how many Boston Marathon records she breaks!